White linen shades have brushed nickel accents at top and bottom for a rich contemporary look. Contemporary indoor lighting fixture includes hardware and installation instructions. Includes 6 feet of chain for height adjustments. Use with (6) Candelabra type, E12 bulb(s) - 60 watt max. Bulbs sold separately. Seagull wing chandelier arms make an attractive center piece over dining area or entry. Includes 6 feet of chain for height adjustments. Fixture attaches to matching decorative ceiling plate and is suitable for vaulted ceilings. Unquestionable beauty meets legendary value. Polished nickel compliments a white linen drum shade, creating an on-trend classic: the 5-Light Drum Polished Nickel Modern Chandelier. Its timeless design features dangling glass beads and clean lines, rewarding any dining room, foyer, kitchen or large bathroom with distinction. Prepare for compliments because aside from the ease of installation, customers rave about the sheer beauty this Modern Chandelier delivers. Updating light fixtures in your home is the most effective way to accomplish a striking, yet simple, DIY remodel. 5-Light Nickel and Linen Chandelier White linen shades have brushed nickel accents at top and bottom for a rich contemporary look. Contemporary indoor lighting fixture includes hardware and installation instructions. Includes 6 feet of chain for height adjustments. 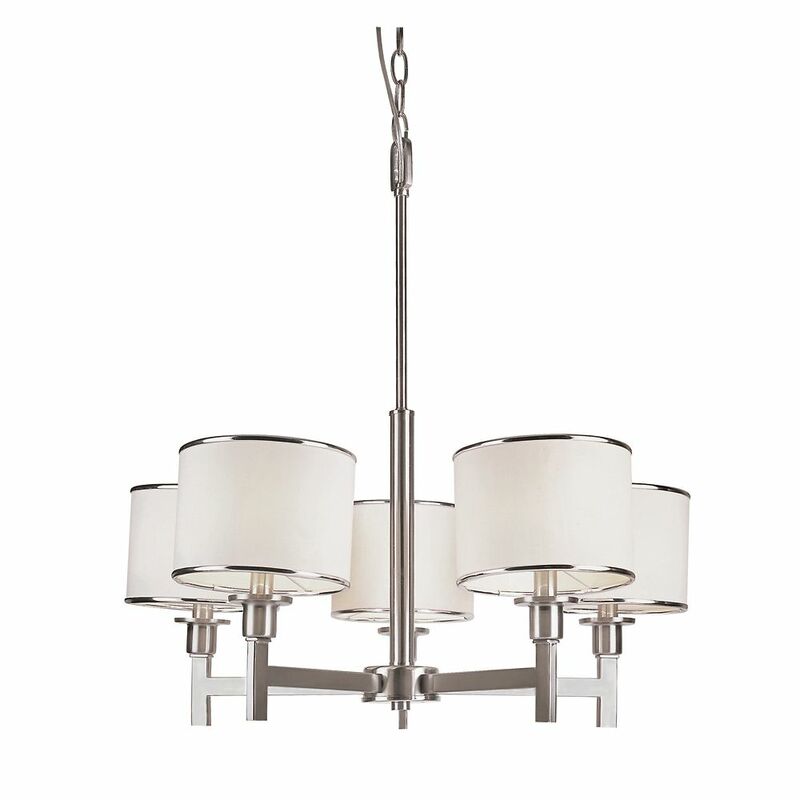 5-Light Nickel and Linen Chandelier is rated 4.1 out of 5 by 7. Rated 2 out of 5 by ElieG from It looks great from afar, but upon closer inspection its lack of quality is apparent. None of the... It looks great from afar, but upon closer inspection its lack of quality is apparent. None of the shades fit securely, making it difficult to get them straight (and maintain it). Also, the silver bands at the top and bottom warp outward at every connection point to/from the center of the shade, making it look dinged or dented. Builder put it in, I'm taking it out. Rated 5 out of 5 by Haley from Has an elegant look with a simple fixture. Easy to... Has an elegant look with a simple fixture. Easy to install but have tools ready to adjust the chain length. Rated 2 out of 5 by Erik from The finish is nice and as expected. The Problem:... The finish is nice and as expected. The Problem: The shades essentially balance on their perch and getting them level/uniform is near impossible. After getting them level, a trick to keep them level is move out of your home and hope the subtlest of breeze doesn't blow through. Rated 5 out of 5 by Woodsy from EXACTLY WHAT I WAS LOOKING FOR !! I love this chandelier! I ordered on-line and delivery was as promised and the light looks exactly as in the picture. It's the perfect size (width & length) for my dining room, and is modern as well as being classy. I would highly recommend this fixture! Rated 5 out of 5 by BQ from Great looking light for a good price! Modern look that... Great looking light for a good price! Modern look that looks great with the style we were hoping to move toward. Rated 5 out of 5 by Love2Teach from Fresh & Modern Fixture Not only was this light easy for my less than handy husband to install, it looks beautiful. I love the touch of silver around the top of the fabric shades and the high quality construction.